The standard mounting is a through-bolt style and the unit is a dimensional replacement for a few competitive models. The maximum output torque peaks at 2,300 in-lbs. 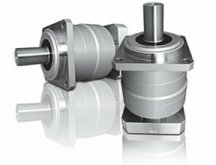 The VRB provides high-precision backlash rating of <3 arc-minutes as its standard, which means the unit provides exceptional accuracy and loading for a good value. The Able VRB Gear Reducers ship in < 2 weeks.